I’ll discuss what seem like Yacht Devices’ good ideas first. Adding a sensor to an NMEA 2000 network usually involves the extra expense of adding a tee connector and a drop cable, or maybe an adapter cable if your sensor has a regular N2K male connector and your network uses Raymarine’s SeaTalkNG (N2K) connector and cable system. Yacht Designs has addressed all these possibilities. You cannot only order the YD sensors with either a standard DeviceNet Micro C connector or the white STng spur connector, you can also specify that either style include a terminating resister. In some cases, then, you can swap one of the two terminating plugs at the ends of your NMEA 2000 or STng backbone with a Yacht Device, no new cable or tee needed. (The blue-based sensor above illustrates this concept because SeaTalkNG usefully differentiates backbone connectors from spur/drop connectors.) With free shipping worldwide, that means the total cost of a new YD temp or baro sensor might actually be $99! But there remains the problem of how to configure a third party N2K device that doesn’t have any other interface. The NMEA 2000 standard purportedly includes a basic command function for this purpose, but I don’t know of any manufacturer that uses it (with the possible exception of Maretron’s ability to configure certain Airmar sensors). Yacht Devices came up with a surprising solution – to program their sensors you use either the chart datum or manual magnetic variation controls available on almost any chart plotter. (The reason for alternate controls is that some plotters don’t distribute changes in one or the other of those values to the N2K network). In other words, YD sensors understand changes made to N2K PGN 129044 or PGN 127258 and can be programmed in all sorts of ways using those changes. The manual (download here) extract above shows how you first put the Yacht Device in programming mode. The last step, of course, is to set the magnetic variation or chart datum back to where it was in the first place, but by then the sensor is programmed without the need for any YD display or some sort of N2K gateway and external software. At any rate, it blows my mind a bit that an installer may find him/herself switching a plotter’s chart datum to “Ireland 1965” in order to move a temp sensor’s data type 5 steps down the list. It sounds crazy, and the whole programming routine may be quite tedious, but it would only have to be done once in most cases (which is why having to get a special display or gateway can also seem crazy). So there are the several reasons I’m glad to see Yacht Devices enter the NMEA 2000 device network, and note that an inexpensive YD Voyage Recorder is coming next. But now let’s discuss some issues. One is that temperature alarming is not supported by many display systems at this point (I use Gizmo’s Maretron displays, but should test the others again). Another is that while quite a few N2K displays can graph barometric pressure, a lot of boaters don’t want to keep their N2K networks powered up all the time, and it’s a 24/7 barograph that can really help you spot weather changes. (I’m working on a comparison of two interesting standalone electronic barographs — Starpath’s Mintaka Duo and Weems & Plath’s model 4002 — and thus more aware than usual that tracking atmospheric pressure still has value.) Note, too, that there’s also the LCJ Capteurs NMEA 2000 BaroPlug available and they had to make a special B&G model probably to take care of some non-standard incompatability. My main problem with Yacht Devices, though, is that as best I can tell the company has not even joined NMEA let alone purchased the 2000 documentation and begun the process of Certification. Maybe I’m missing something when searching the NMEA public records, but Yacht Devices has also failed to answer two inquiries on the subject. If true, I think it’s just plain wrong not to contribute in any way to the largely volunteer organization that created the standard your product is based on. But then again, the N2K Certification part is trickier business. Of course, I prefer to use certified devices on Gizmo — they’ve undergone testing of their network compatibility (though not what data PGNs are sent or displayed). But I’ve noticed that many devices, even from major brands, are not certified. For instance, I see nothing certified from either LCJ Capteurs or B&G. And I don’t think that the Simrad NSS evo2 displays or the Raymarine gS12 currently on Gizmo are certified, not to mention a bunch of smaller devices. So besides any comments you may have on Yacht Devices, I hope some of you will go to the NMEA 2000 Certification database and see if your gear is in it. And/or maybe someone can explain what the heck is going on with certification? Previous story Nobeltec PC Radar & TZ v2 app, blazing trail two ways? Well I jumped right on this and sent away for one to install in a fish box. They have refrigeration and I have been looking for a way to monitor the box temperature from the helm without spending what it would cost for a Maretron TMP100, which is overkill. Guess that will make me a Panbo guinea pig. Well timed post. Have been thinking about this for a while and was trying to decide between the Baroplug and a Garmin GWS 10 wind transducer which also gives air pressure and temperature. But running the N2K network all the time is a bit off putting and really would like a standalone solution. The link to Weems & Plath doesn’t seem to work. They seem to be used a bit in Europe. Did you look at this one: http://www.bohlken.net/bg/bg1512_en.htm ? I also shows 48 hrs and has an inbuilt alarm. “Starting with the publication of this pricelist older prices are invalid. I use the bolken since 4 years. Works perfectly. The only thing to watch out for is the backup/offline batteries. If you layup your boat during the winter, then remove them as otherwise they drain and start to leak. Rs232 output is connected to my onboard PC running Maxsea which provides me even with a longer history then 48 hours. And higher resolution for analyses as well. Further the alarm for a drop of 3 hp in hour works well. They seem to be the sales agent and quote €361.25. The €295 must be an (very) old price. This is great stuff! Love seeing all the new gizmos, especially since the radar on my old C70 unit seems to have died while cruising through New England the past few weeks – making it so I’ll probably be looking for a new electronics package next Spring (On a side note, I sure wish Raymarine and others would recognize the investment people have put into their brands and give larger discounts for upgrades to new platforms. Without a good incentive, I’ll probably compare the options with all of the major brands as opposed to sticking to Raymarine). One other barograph to check out is the NASA Marine Meteoman ( http://www.nasamarine.com/proddetail.php?prod=MeteoMan , also available on Amazon). It doesn’t have all of the features of the Mintaka, but it’s half the price – and I think nicer than the W&P unit (which I evaluated when I bought this one). I don’t wire mine directly to my 12v power on my boat. I wire it to a USB battery bank/charger, which is then wired into the boat using a 12v direct to USB adapter ( http://www.amazon.com/gp/product/B00CP1LQLY ). That way I can turn off all of my electrics for a week or two, but still power the barometer. The link to “LCJ Capteurs NMEA 2000 BaroPlug” is actually pointing to the Yacht Device news page mentioned in the previous paragraph. You mention “they had to make a special B&G model probably to take care of some non-standard incompatibility”. This is not exact. 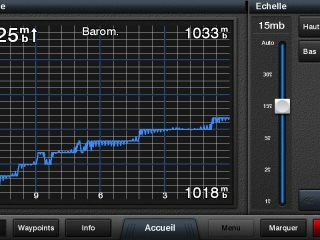 When BaroPlug was developed, the NMEA2000 version was V2, which did not display the pressure value with decimals. NMEA2000 V3 came out, where the pressure value can be displayed with a decimal, and the BandG products have implemented that V3 version very early. We made a BaroPlug version to address this and allow BandG users to enjoy the display of a value with one decimal. Since June 2015 we have a new version of BaroPlug “Dual” which handles both V2 and V3 versions of NMEA2000 and which also includes a temperature sensor. This is truly a Plug and Play device: Install the sensor on your NMEA systems backbone. 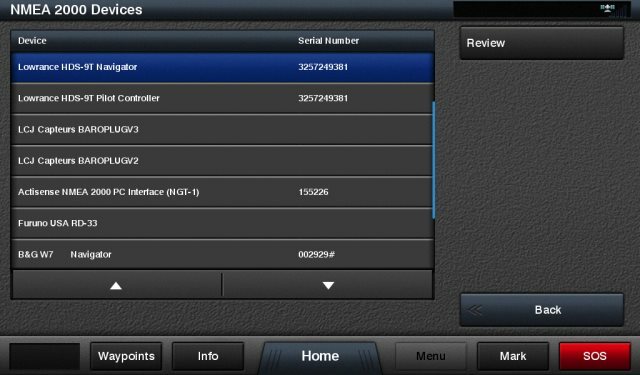 On a connected display, choose the appropriate source between BaroplugV2 or BaroplugV3, depending you have a NMEA2000 V2 or V3 system. That’s it! Note that NMEA2000 does not manage the simultaneous reception of the two V2 and V3 PGNs. As a result, a device which would send both messages would create an alternating reading on the displays between the value to the Mb and the value to the tenth of Mb. This is why BaroPlug generates two virtual devices: BaroPlugV2 and BaroPlugV3. 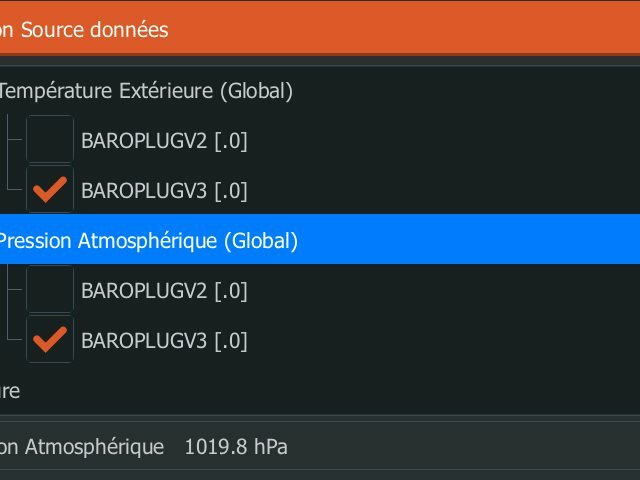 BaroPlug is factory calibrated and should not need any further calibration but the two NMEA PGNs “set pressure” and “set temp” are implemented in BaroPlug. These messages are specified in NMEA2000 and could be used if a display handles them. I can imagine that it’s easy to set up the Dual using the virtual identities but I have heard complaints about how Navico assigns multiple virtual identities to some its MFDs. The problem occurs on larger NMEA 2000 networks that are approaching the maximum of 50 physical devices. Apparently two virtual devices look like two physical devices. And, sorry, but I feel obliged to ask you if LCJ Capteurs is a member of NMEA, has purchased N2K documention, and/or is pursuing Certification for the BaroPlug? I understand your point about multiple virtual devices on a network, but, actually, do you reckon that over 50 devices may be present in a system? Is it a real issue, or just a technical principle one? If the case occur, would a router/bridge help by splitting related functions? Thank you for the comment anyway. We will keep hat in mind. Regarding your questions about NMEA2000 membership, please note that our manufacturer’s number is 499. – We joined on the 10th of July 2012. Regarding certification, note that a group of French marine electronics companies together with the University of Rennes is planning to get the certification tools so that we can process to certification locally, at least for the first step, before validation by the NMEA. We are expecting to see that in place in Septembre. These days I find myself trying to make sure that do-it-yourself boaters understand that NMEA 2000 is often not quite as simple as “plug n play”. Too many are getting themselves into trouble by not understanding the basics of backbone/drop architecture, termination, voltage drop etc. At any rate, sorry again for putting you on the spot about NMEA but I’m glad to hear that LCJ Capteurs is supporting the organization and standards. The point I’m trying to make with readers is that NMEA 2000 can’t evolve without the financial and volunteer support of the manufacturers who use it and that your baro sensor competitor Yacht Devices does not seem to be supporting NMEA at all. What looks like a good value might not be in the long run! No need to apologize Ben for asking the NMEA question. Any firm selling NMEA 2000 product has a responsibility to support NMEA. as I wrote you earlier, we plan to start the NMEA certification process in September. Before doing that, I wish to investigate the limitations of NMEA license to be completely sure what “NMEA intellectual property” means,why it must be protected by a fire-walled gateway, and what other restrictions for developers exist. I have read a lot of material against NMEA. But I think in any case we’ll join it and play by its rules. Given the low price compared to alternatives, I went ahead and sent away for one of the Yacht Devices temperature sensors. My plan is to put the sensor in one of the refrigerated fish boxes so I can monitor temperature from the helm. The process was a little complicated because the hardware is shipped from Russia. The US Postal Service for some unknown reason decided the package was undeliverable after it made it to our local post office and sent me a notice saying it was being returned to the sender. I contacted Aleksandr, who promptly arranged a refund and offered to send another unit. I was not home at the time, so of course the next day my wife said “you got a little package that has Russian writing on it.” USPS tracking is still convinced it is on its way back to Russia. In any event, I plugged it into my NMEA 2000 network and created a data box on a Furuno TZT 2 MFD for air temperature. The YD worked just fine and reads to one decimal place. I haven’t tried the somewhat daunting (but clearly explained) process for changing the label to “freezer”, which is done by resetting the magnetic variation or chart datum on a plotter connected to the NMEA 2000 network. > NMEA 2000 can’t evolve without the financial and volunteer support of the manufacturers who use it … in the long run! NMEA is ‘proprietary crap’ behind closed doors. BOATING can’t evolve without open accesss to the PGN definitions. Even Microsoft changed and started to cooperate, NMEA is still in the stoneage: pay extorsion fee for ‘standard’ access, be forbidden to talk about. Everything which damages the current NMEA way of ‘standard’ is good imho and has the potential to improve boating. People should support companies who do _not_ bow to the unreasonable NMEA conditions! Johnny, have you tried to get ABYC standards for, say, “AC & DC ELECTRICAL SYSTEMS ON BOATS”? Yup, you have to buy them. And they are not cheap because the fee is meant to support the whole standards-making process. So are all the ABYC standards also “proprietary crap behind closed doors” in your world? Would ignoring ABYC standards improve boating? Nifty idea! Here’s the thing: a great many open standards are not freely distributed and if you actually examine those that are you’ll see that they are financed by universities, governments, and/or huge corporations like Microsoft. Then there are open source standards, which is really a different model and great in terms of speed and creativity. I’d be hesitant about having my boat’s critical systems running on open source standards (unless they’re locked down tight like the Linux on many MFDs) but I’d sure like to have my boat data available to an open source development world. Which is exactly what’s happening with Signal K and NMEA 2000. I don’t think it will be very long, for instance, before the output of N2K sensors like Yacht Devices’ is available in the open source SK format that even DIY developers can go wild with. …though it may make your righteous whining seem foolish. Sorry! The company founder is also coming to the NMEA Conference in Baltimore in 2 weeks. So it looks like that issue is being resolved, plus I’ll get to meet him. My entire career for the last three decades or so has been domestic (USA) and international standardization (software) in multiple standardization venues. Standardization is a shining example of inherent conflict between information and costs. It costs real money to run standards organizations, and that money has to come from somewhere. Some venues, such as ANSI, are funded by high membership fees that give participants (corporations and individuals) the right to submit proposals to standards in which they are interested, as well as to read those standards. Those venues also charge money for paper and electronic copies of their standards. They may also charge licensing fees for use of certain standards. I would guess that NMEA falls into this category. Other venues, such as ISO and IEC, are funded by high membership fees that give members (national body standardization organizations, such as ANSI, DIN, and ITSJ) the right to submit proposals to standards in which they are interested, as well as to read those standards. Those venues also charge money for paper and electronic copies of their standards. They may also charge licensing fees for use of certain standards. Still others, such as the World Wide Web Consortium (W3C), charge very high membership fees that give members (corporations and individuals) the right to submit proposals to standards in which they are interested. However, the standards themselves are available to the public at no charge and are freely downloadable. It is far from clear which model is “best” for each different kind of standard. Each of the models mentioned above works well for some parties and not so well for others. For years, people predicted that the ANSI and ISO/IEC models would eventually collapse of their own weight and evolve into a W3C-like model. That hasn’t happened, and W3C has at least as much problem funding its operations as the other models have. There’s an old saying that “You can pay me now, or you can pay me later.” Standardization has to be paid for, and the only question is how. Those who benefit from standards (e.g., we sailors benefit from NMEA 0183 and NMEA 2000) must realize that those standards are paid for by somebody, and that somebody ends up being us in the long run. I glad to inform that today I got confirmation from Steve Spitzer that Digital Thermometer officially passed the certification. The way was a bit longer than expected. All other products of Yacht Devices are internally tested with Certification Tool and comply to Level B at least (Level B is deprecated now). But we will continue to officially certify our products with NMEA. Now, after the first product, it will be much faster. Your first link in the last reply doesn’t work. I’m intrigued about your mention of a gateway for not quite 1929 Volvo Canbus. Sorry, that is a strange link. I can’t even edit the comment. Humidity Sensor for NMEA 2000 is ready and… CERTIFIED! Datum/variation sequence “technology” (used in all our sensors) is compatible with a legacy chart plotters and works well when you need to switch something, but entering of numbers (sensor offset, etc) is not comfort. Humidity Sensor supports PGN 126208 also (Request Message, Command Message and Write Field) and many settings can be configured by “official NMEA way” implemented in Maretron and ActiSense software. This way is based on enetring of special strings (with prefix “YD:”) to the Installation Description Field 2 of device. For example, “YD:PGN 130311 1000” changes transmission interval of PGN 130310 to 1 second. It can be done with Maretron N2K Analyzer, ActiSense NMEA Reader, and it may be posiible from some chart plotters (can’t confirm right now, but I’m sure that I seen it). I jumped on quite a few of the Yacht Devices products and was very happy with the quality. Over the last year I’ve worked with Aleksandr on the development of the J1708 converter needed for some of the older Volvo-Penta EDC II based diesel engines serving as a guinea pig for the development. I was extremely pleased with his products but a little frustrated by the lack of a U.S. based source for the products. I’ve been so pleased with the products that I decided to start distributing them in the U.S. I am going to be stocking all of the Yacht Devices in the U.S. with availability within 3 business days. Good timing, Ben, as the recent samples I received from Yacht Device’s home base in Kaliningrad were over a month in transit. That was probably an anomaly but it’s great that you’re stocking all YD devices here in the States.